A one-month-old baby has been hospitalised at the Princess Marie Louise Children’s Hospital days after the unfortunate demise of a two-year-old boy and nine months old twin girls due to the inhalation of a pesticide, Topstoxiin. The Daily Heritage newspaper reports that the mother of the 4th victim, Cecilia Mensah, said immediately after she visited the home of the parents who lost their children, she breastfed her baby. Cecilia said she had rushed to the room of the deceased children to carry one of them when their mother screamed for help. She said she gave her child breast milk immediately after the she returned without taking her bath because the baby was crying uncontrollably. Doctors at the 37 Military Hospital first noticed the 4th baby after the now deceased kids were rushed to the hospital assisted by Cecilia and other tenants of the house. The landlord, who did not want to be named, told the Daily Heritage that doctors at the 37 Military Hospital all tenants for at least three days but he did not obey because he felt the accident happened because the instruction for use of the of the agrochemical was violated. Three children died at the 37 Military Hospital after their parents reportedly sprayed an agro-chemical to check some crawling insects at their home. The sad incident happened on Friday, April 20, 2018. The parents of the deceased children – nine-month-old twin girls and their two-year-old brother – sprayed the insecticide in the evening of Friday in a bid to tackle cockroach infestation, however, by midday the next day the children had died. 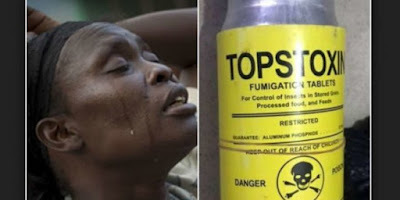 The family, said to be residents of Abavana Down, a suburb of Accra, arrived at the 37 Military Hospital with severe respiratory problems, hours after inhaling the deadly substance called organophosphate, found in a product called Topstoxin. Meanwhile, Food and Drugs Authority (FDA) and the Environmental Protection Agency (EPA) are currently working to trace the distribution channel of the poisonous agro-chemical.